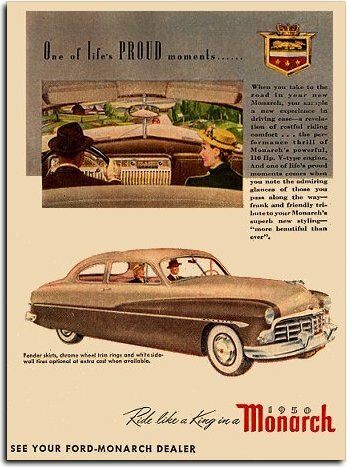 At $2,251 plus taxes and tags, the 1950 Monarch Sport Sedan was the least expensive model in Ford of Canada's regal family of fine cars. At the end of World War Two, Ford’s top brass was poised to return to civilian manufacture as Canada's leading automaker. Workers in Windsor had their own ideas. Fed up with what union leaders labeled as high-handed management tactics, workers laid down their tools on Wednesday, September 12th at 10 o’clock in the morning. They had honoured the contract for government and the last vehicle for King and Country had rolled out the doors. When the shift change whistle blew, the entire work force marched out of the plant in military precision. The strike would grow ugly and paralyze the entire country for ninety-nine, long bitter days. So vital was Ford to the national economy that the work stoppage affected virtually everyone. Many Canadians demanded that the Prime Minister recall Parliament, which was pirogued for Christmas recess, to deal with the strike. Every day grassroots opinion grew louder for Ottawa to take over Ford and run it as a Crown corporation. The government dithered while Windsor turned into a battle zone. Supreme Court Justice Rand finally brought the dispute to an end with his brilliant landmark ruling that all employees would pay union dues but Ford could maintain an open shop. The strike was just the tip of the iceberg. There was more corporate woe. Ford’s American parent was in serious trouble. Once the world’s leading auto manufacturer, the company was floundering badly. Now in his eighties, Henry Ford still ran the show-on paper-but showed little to no interest in the day-to-day affairs of business. Analysts had downgraded The Ford Motor Company to a “B” player, just a notch above independent Studebaker. Fortunately, young Henry Ford II was the right man to replace his grandfather and the company’s fortunes began to brighten considerably under his astute leadership. The 1946 Mercury pickup trucks were assembled in Windsor, Ontario and Burnaby, British Columbia. 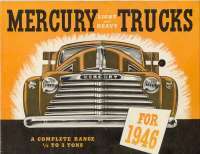 The newly formed dealer body was also given Mercury trucks to sell, to make the parting sweeter. The Lincoln-Mercury sales arm started out with 353 dealers and a highly profitable line of products. Those 760 Ford dealers would not do without, either, they would handle a new line of passenger cars. 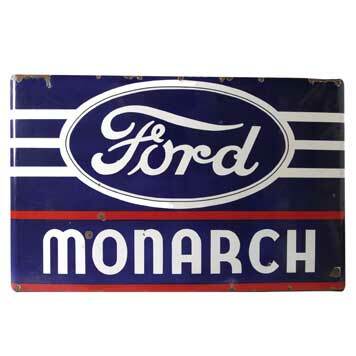 The marketing department at Ford of Canada made sure that the new Monarch leaned heavily on our royal heritage with the United Kingdom. The new brand was announced to Canadians on March 21, 1946. Christened Monarch, it reflected Canada’s close ties to Britain. Ford Canada’s execs gambled that Monarch was the perfect product to plug the gap between the entry level Ford and the mid-priced Mercury. If the white collar boys in Windsor were right, they’d get two mid-priced cars for the price of one and steal significant market share from Oldsmobile, Pontiac, De Soto, Dodge, Nash and Hudson in that tiny, but oh-so-prestigious segment of the Canadian market. 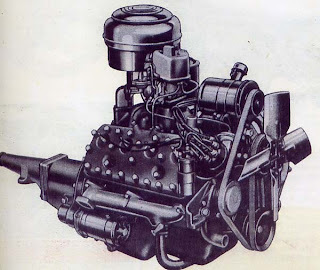 Monarch started life with on a Mercury body shell and used its chassis and V-8 power plant as well. Monarch was cloaked in highly distinctive trim, a unique grille and crowned with a regal lion motif. While sharing an engine with Merc, Monarch was billed as having a 95 horsepower rating while the Big M registered an even 100. The difference seems to have been nothing more than a little white lie cheerfully encouraged by some highly creative ad copy. Canada’s newest automobile brand made its debut with two and four-door sedan models, a club coupe, a ragtop and four-door wooden-bodied wagon. For the wagons, maples were milled in Ford’s own private forests in Michigan and the wood shipped to Windsor. Only 33 of the Monarch wagons were built in 1947. Backed by the famous blue oval, the total for the new marque was a respectable 3,858 units in its maiden year. Execs in Windsor could raise a pint in victory. Putting things into perspective, Some 20,000 Mercury cars had been built in Canada that year and Monarch sales added almost 25 percent to that figure. The gamble had paid off handsomely. In its second year, Monarch production was 6,670 units but the beautiful woodie was replaced by an all-steel wagon, of which exactly 40 were built. Only 723 Monarchs were built in 1948 (a very short model year) and were offered only as two and four-door sedans. Ford closed the doors of its assembly plant in Vancouver, British Columbia that season and production was concentrated in Windsor, Ontario. The vibrant post-war economy was in full swing and the Federal Government of Canada, having finally balanced its budget, dropped restrictive taxes on domestic consumer goods. A 110-horsepower V-8 added plenty of speed to Monarch’s elegant pomp and circumstance. For 1949, Monarch and Mercury shared a new body. Dealers received an in-house newspaper called the Monarch News. The first issue was dated May of 1948, its eight pages jam-packed with pictures and specifications. Monarch production shot through the roof in an extremely long model year as 11,317 units were built as four-door sedans and club coupes. 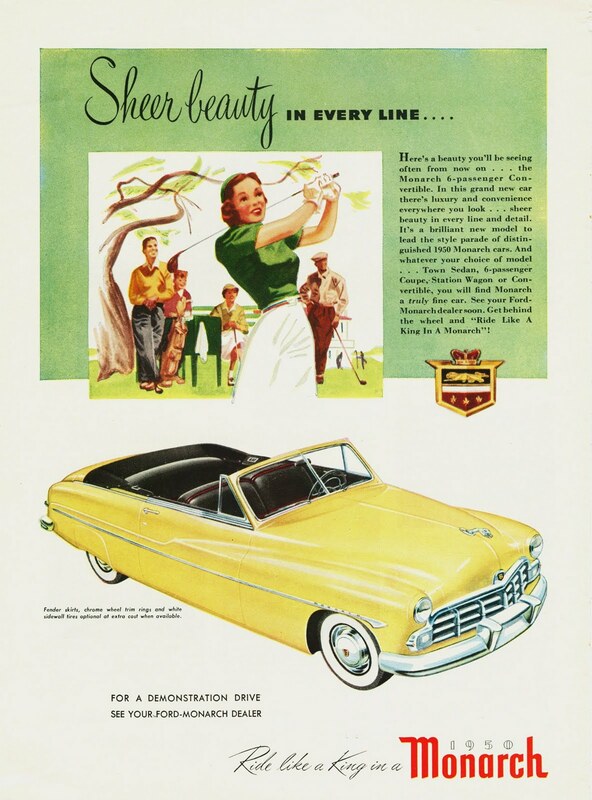 The 1950 Monarch six-passenger convertible carried a hefty retail price of $3,089 before taxes, though it did feature power windows and power front seat as standard equipment. 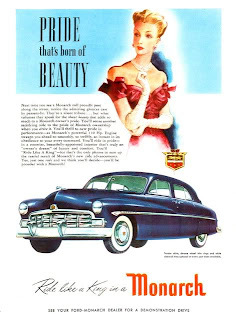 Billed as “more beautiful than ever for 1950,” the Monarch line doubled in size as a breathtakingly beautiful convertible and a two-door, prestigious maple and mahogany woodie wagon joined the Sport Sedan and the Six-passenger Coupe. Prices were cut and that stimulated sales, too. The 1950 Monarch Sport Sedan. Advertising promised would-be owners that they would “ride like a king in a 1950 Monarch. ” All Monarchs loafed along the nation’s highways and byways with a thunderous 110-horsepower V-8 under the long, low hood. Occupants did indeed ride like royalty on the “personalized comfort of Select-0-Seat front seat springing” covered with deep foam rubber cushions. 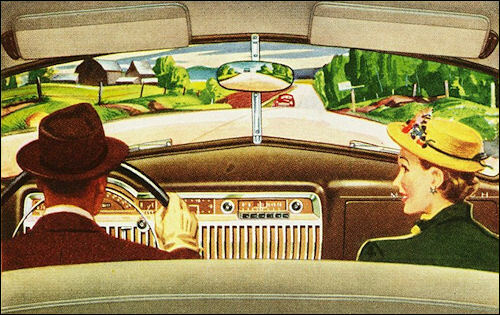 Instrument panel of the 1950 Monarch was borrowed from its Mercury cousin. The ragtop could be ordered in two exclusive colours, namely an eye-popping Mirada Yellow or an eye-turning Matador Red. It boasted a power top and three choices of leather interior colour combinations. “Take the wheel of this superb beauty and enjoy the greatest driving thrill ever!” the sales brochure urged. The Monarch station wagon was deemed as “right for every occasion!” This cavernous vehicle was big enough to qualify for its own Postal Code and offered comfort and safety for eight passengers in three seats upholstered in the owner’s choice of red or tan leather. Advertising boasted that, “Easy removal of the centre and rear seats quickly converts the Monarch station wagon into an efficient light utility vehicle with 188 cubic feet of storage space.” The stylish station wagon measured an impressive 214 inches in length, a full seven inches longer than sedans. It was also the most expensive Monarch at $3,523, costing $106 more than its ritzy ragtop stable mate. Monarch’s option list was as long as a winter’s night on Ellesmere Island. Touch-O-Matic overdrive, a six-tube radio with push buttons, seat covers, rear fender skirts, white sidewalls, chrome trim rings to dress up those hubcaps, exterior sun visor, road lamps (for rain and fog) and back-up lights were among the goodies one could add to one’s vehicle. Monarchs could be ordered in any of six solid colours, as trio of extra-cost two-tone schemes or three extra-cost, metallic finishes. 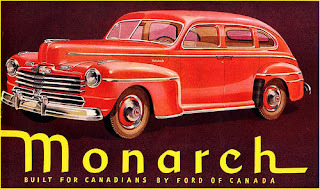 No body style breakouts were recorded but the final total for the 1950 model year was 6,056 new Monarchs registered and on the roads from St. John’s to Victoria. It was the swan song year for Monarch’s wagons, though the Monarch line would continue on, entrenching itself deeply with consumers. Without a doubt, the 1950 Monarch station wagon is one of the most rare post-war production wagons ever built by a North American automaker. Only three are known to exist. But one never knows, eh. There is always the hope that a 1950 Monarch woodie does exist, quietly waiting in noble exile, in a barn somewhere in Wild Rose Country, a scrapyard in la belle province or hidden away from the elements in a shed just down the road from Green Gables. Copyright James C. Mays 2004 All rights reserved.